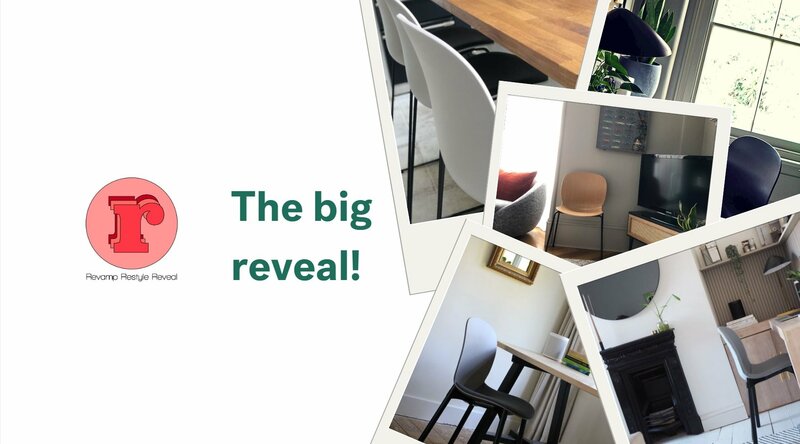 Earlier this week we took a look at some of our favourite projects from 2017 we had the pleasure of being a part of. Today we take at our top office designs of 2017. Architects and designers around the world continued to inspire with impressive projects pushing the boundaries of how companies can provide for their employees. 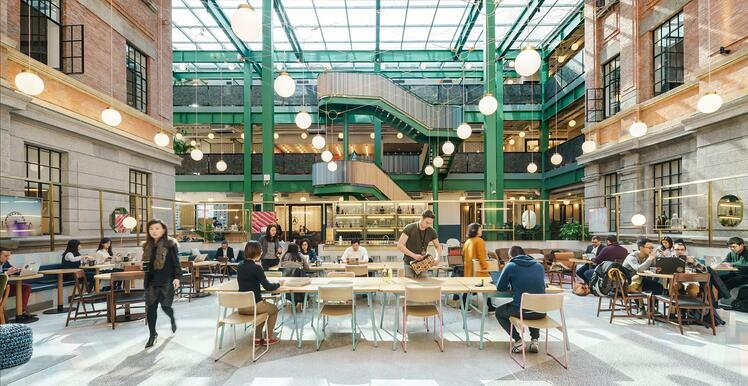 2017 saw co-working pioneers WeWork begin operations in China, and their flagship premises opened in February, transforming a former opium factory in Shanghai’s Jing'an District. 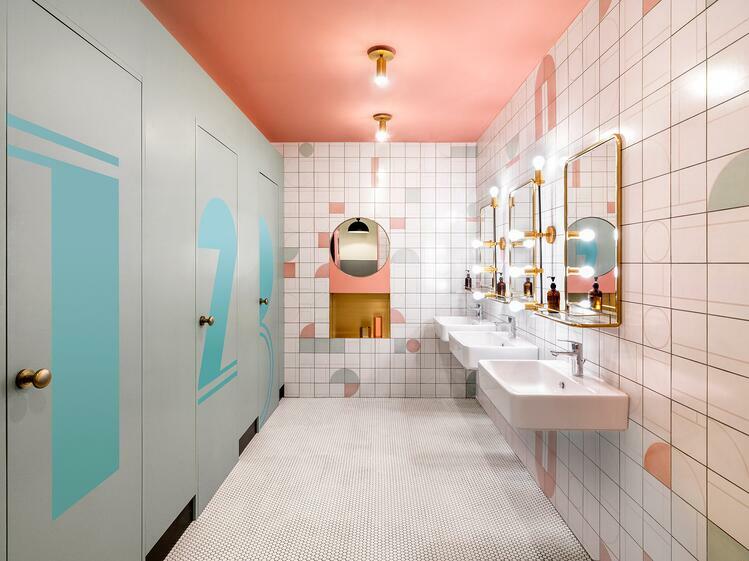 The interior mixes existing structures with new ones, creating an impressive visual with lots of bright colour and light. A variety of work and recreation zones are connected via a green steel staircase which weaves through the circulation space, connecting three levels together. Two pantry areas that play on the opium factory narrative have large poppy wallpapers, hand painted in gold. 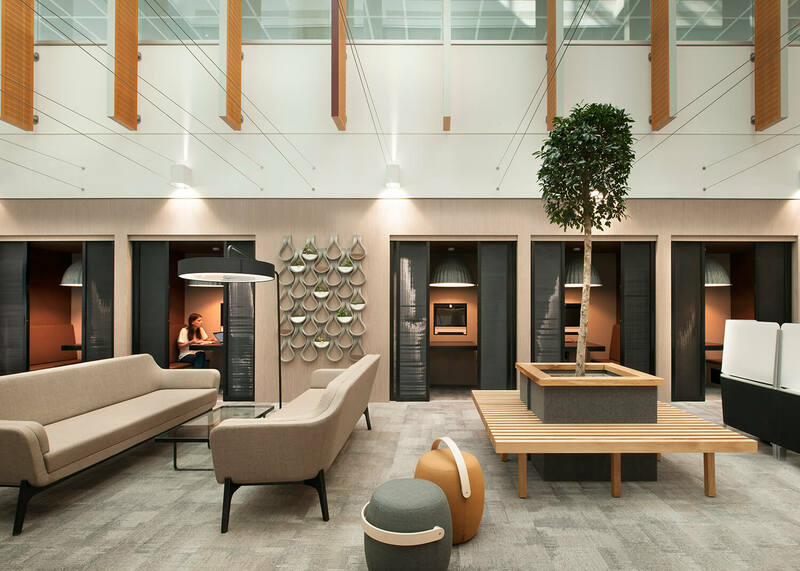 Online fashion retailer YOOX Net-A-Porter unveiled a new Tech Hub complex in central London, heralding a new way of working for the brand. 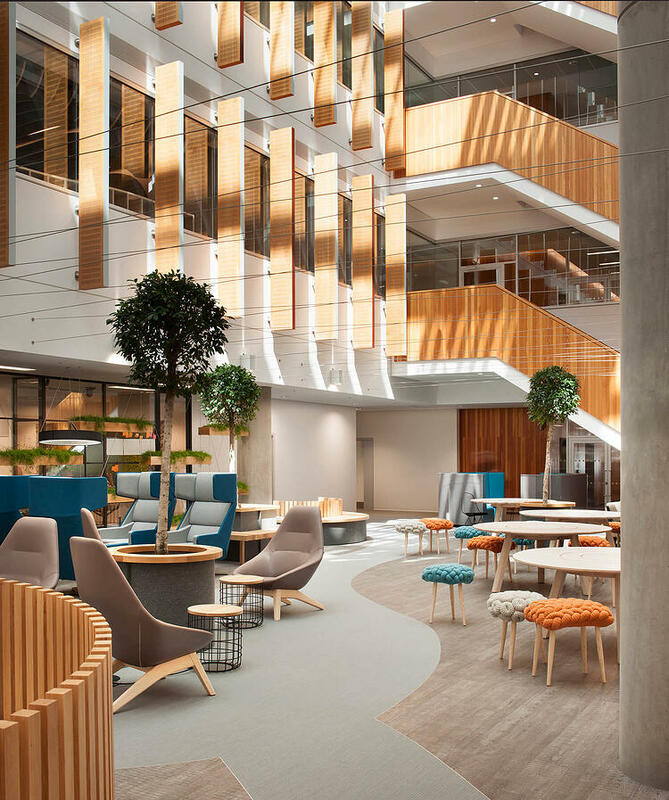 Occupying the former BBC Media Works building at White City Place, the 70,000 sq ft office has been described as a “temple of innovation” by YOOX Net-A-Porter CEO Federico Marchetti, who enlisted award-winning architectural practice Grimshaw to design their new workspace. Federico Marchetti came into the project with a clear vision – to increase communication between his team members, to instil a greater sense of community in the workplace and make people want to come to work. The idea behind this vision is that by incorporating these ideas, people will feel better, work better, and keep Net-A-Porter at the cutting edge of e-commerce. 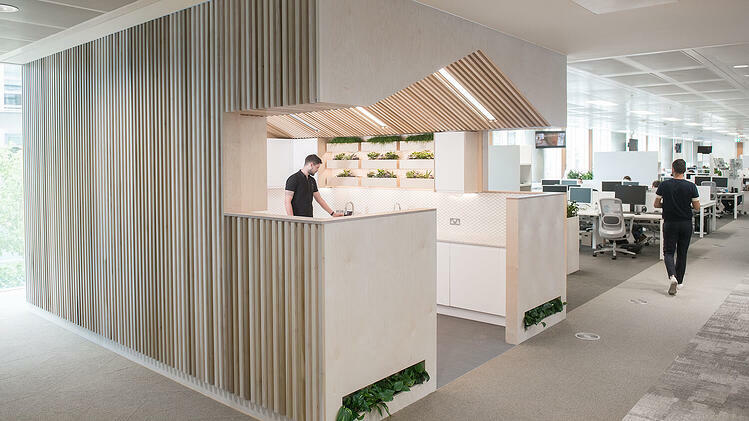 Embracing the architectural values of adaptability, flexibility and sustainability, the project involved using natural materials, substantial greenery and an array of innovative furniture which enables different ways of working. 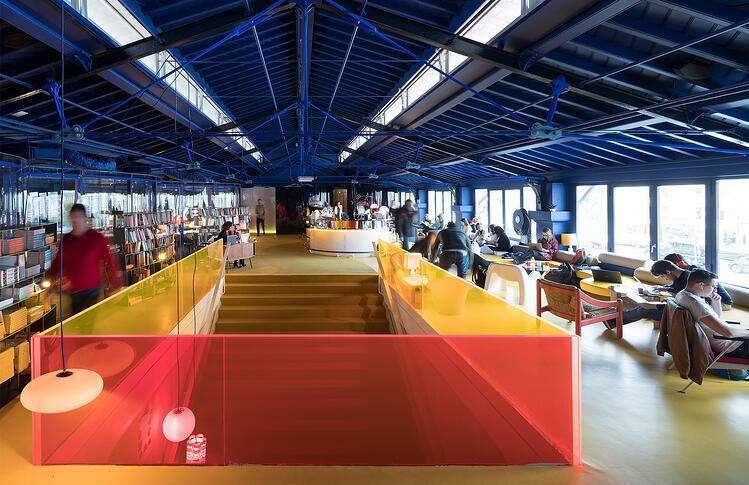 Second Home Lisboa is the second co-working office designed by SelgasCano for Second Home, a shared workspace company founded by Sam Aldenton and Rohan Silva in 2014. 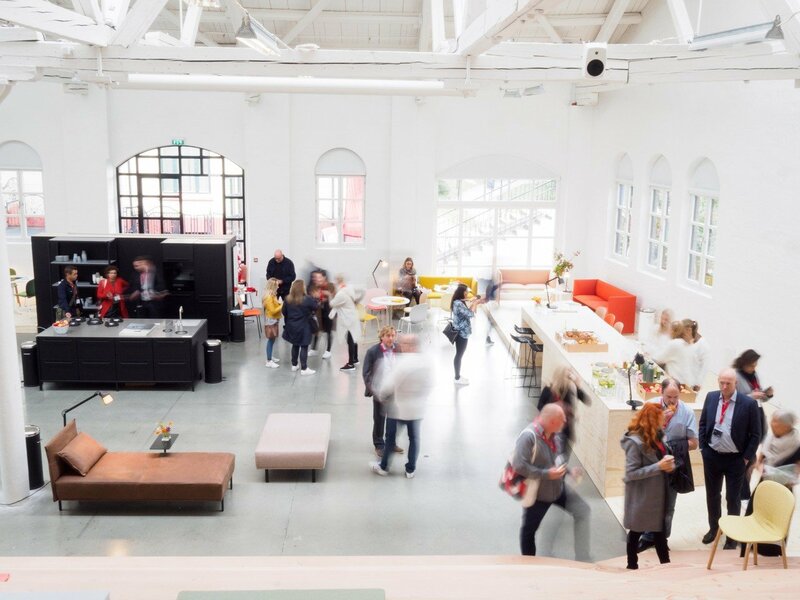 Opening in Bebruayr 2017, their Lisbon offices can be found in part of Lisbon’s oldest food market, and have been turned into a plant-filled paradise. 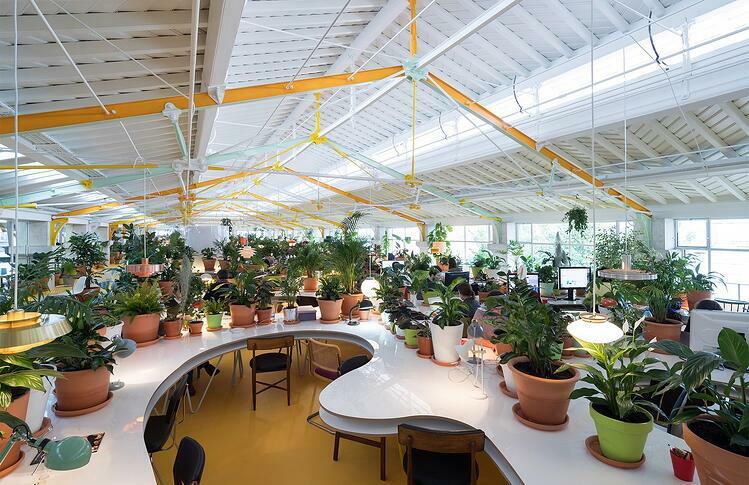 1,115 metres of open plan office space is filled with a variety of flexible furniture, with spare desk space covered in a cornucopia of plants. The original columns and ironwork is painted in navy, yellow or mint green, in contrast to the white roofing. 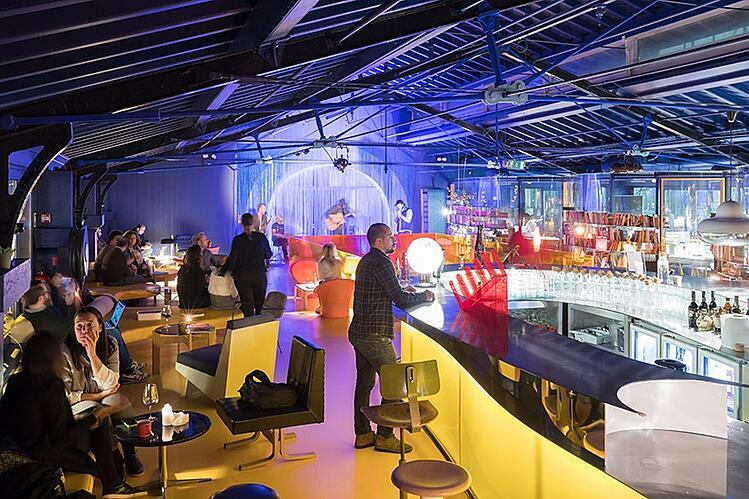 The social areas are quite different to the garden-like workzones, with a bar, café and stage included. 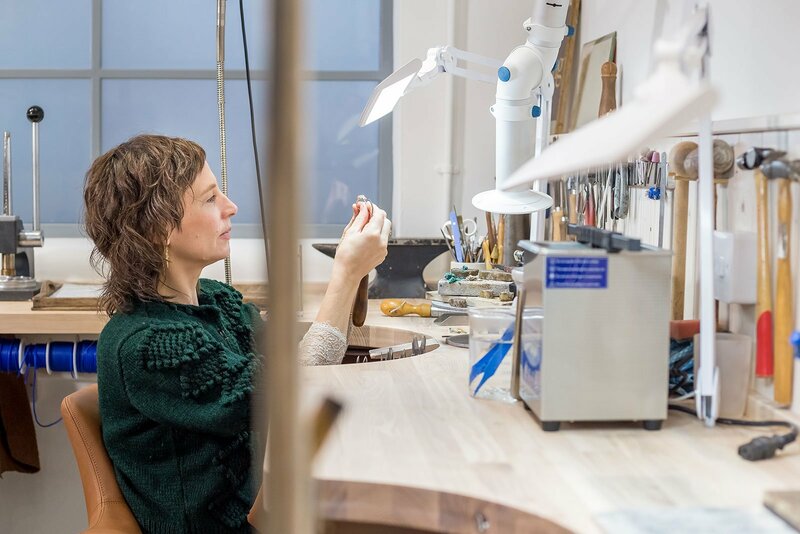 Sharing her vision for the project, Lucai Cano said, "We wanted absolutely to maintain that inherited idea of one single open space, getting small companies to share a huge table divided in three, encouraging relationships… The flowing design of the table gives members their own area of private space to focus on their work whilst keeping a sense of community." Globant have been developing innovative software since 2003, and currently have 19 centres across South America. In 2017 they opened their new headquarters designed by Architects AEI Arquitectura e Interiores. 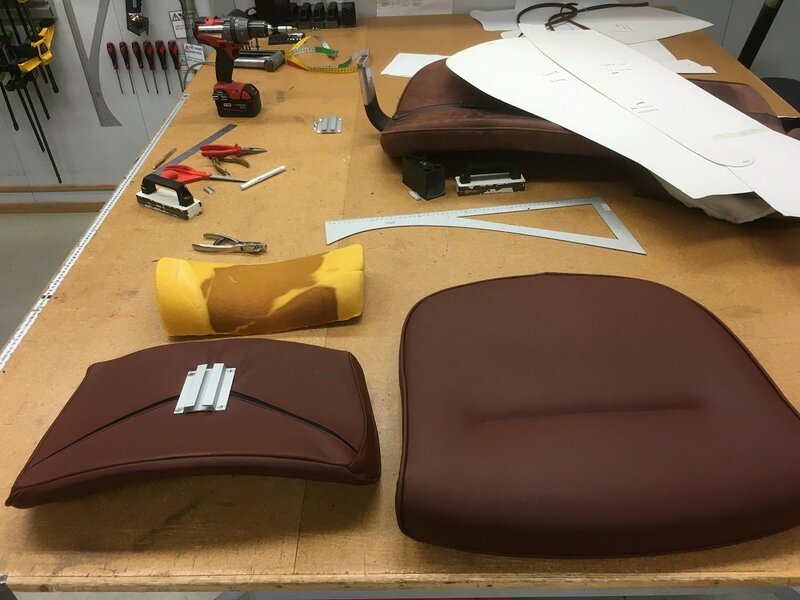 With a high focus on comfort and well-being the designers implemented concepts related to the company’s philosophy – to interact, to experiment, to travel, to discover, to play, and to have a story to tell. 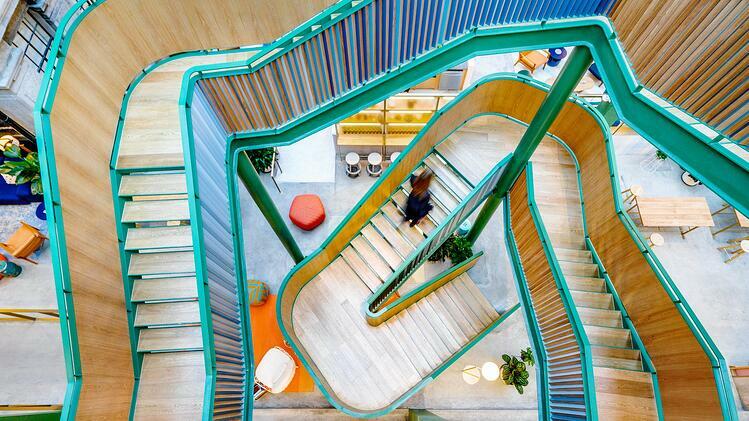 Split across several floors, each office has a particular theme, and they are decorated with playful and inspirational colours, textures and objects. 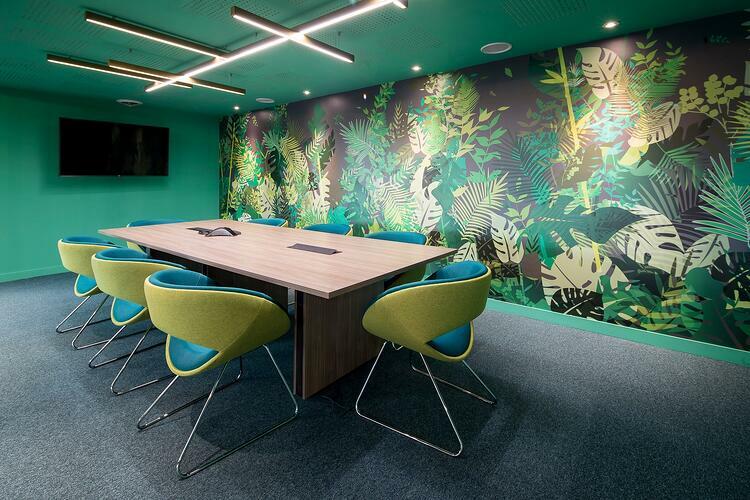 A flexible design, the office incorporates open-plan environments as well as all different sized meeting and focused work rooms, as well as social areas for relaxation and sustenance. An impressive office, it is incredibly striking, and would leave a lasting impression on any visitor. Undoubtedly the most talked about office building to open in 2017 was Apple Park, the new headquarters for Apple Inc. Located on a suburban 175 acre plot, the four stories circular building is an impressive 2,8 million square feet, houses 12,000 employees, and cost an impressive $5 billion. 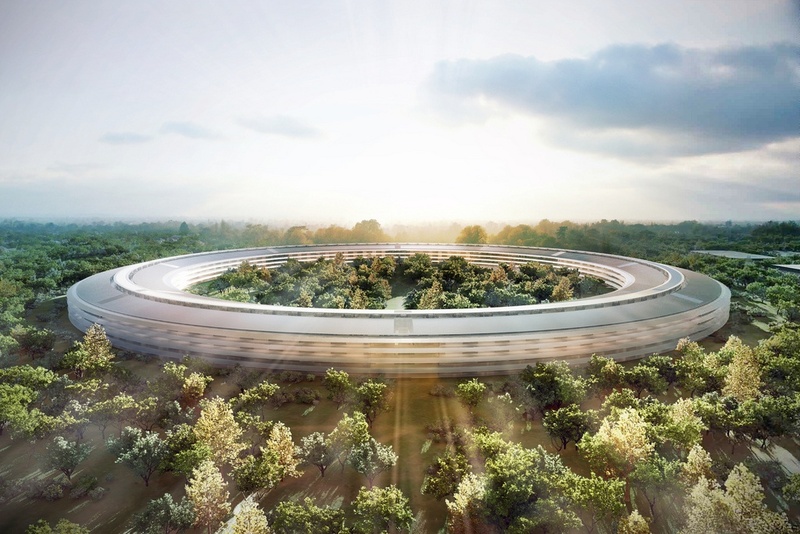 Designed by the late Steve Jobs in collaboration with Architect Norman Foster, Apple’s new headquarters is a marvel of modern design, incorporating a wealth of sustainability innovations as well as facilities to cater for the well-being if the staff. Powered by 100% renewable energy, it has one of the largest on-site solar installations in the world. 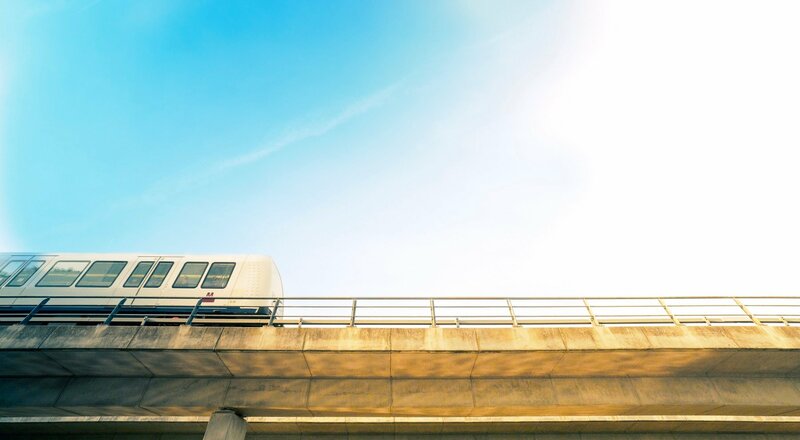 A natural ventilation system keeps employees cool, and over 9,000 trees were planted in the green spaces, which takes up 80% of the overall site. 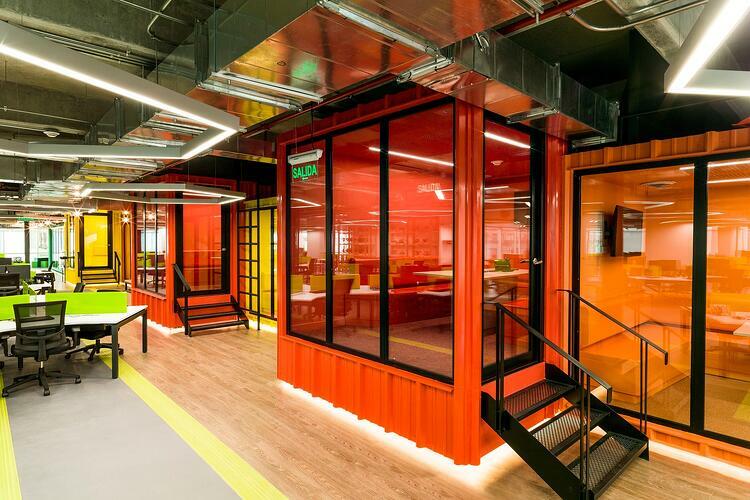 The different working areas are divided into modular sections, known as pods, that will are used for office work, teamwork and social activities. 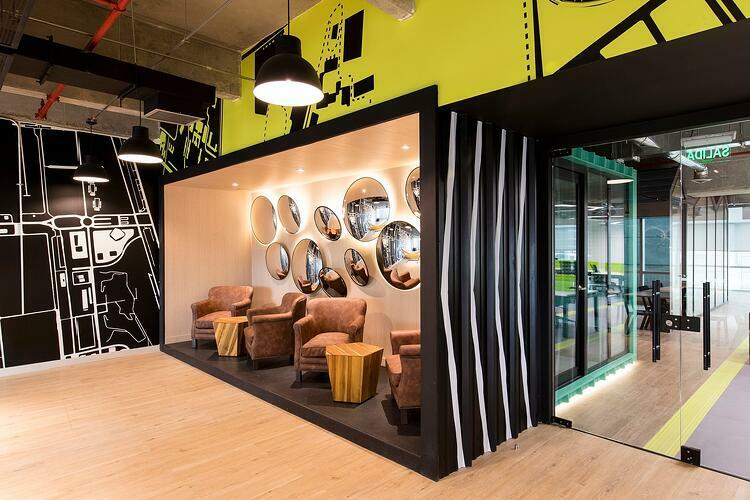 Everyone from the CEO to summer interns will be placed into these pods, helping employees build connections. Whilst there has been some rumours of staff not being too happy with the design, the ambition of the project cannot be dismissed. Speaking about the project Apple CEO Tim Cook said, "The workspaces and parklands are designed to inspire our team as well as benefit the environment. We've achieved one of the most energy-efficient buildings in the world and the campus will run entirely on renewable energy." Located within the 'ring' is the Steve Jobs Auditorium, with the theatre space located on the basement level, that seats 1000.